We would like to inform you that there will be an increase in prices of DXN Products effective March 1st 2014. The price increase is the result of the continued rising cost of raw materials, transportation, energy, and overall operational costs. Appropriately, the Company realizes the need to institute such changes without compromising the quality of its products in return. We wish to thank you for your continued support to the company and for understanding the necessity for this price increase. You may download the new price list by login to www.dxnusa.com/AutoTrack. Should you have any questions, please contact Daxen office at 909-348-0188 during office hours. Here we offer you some great DXN promotion in the USA! Want to receive a $500 VOUCHER? Available March 1st thru May 31st 2014. How to order DXN products? – Click here for more information! How to have cheaper, distributor prices with a registartion? Click here for more information! DXN White Coffee Zhino Cappuccino is an Italian coffee drink which was invented around the 1900s and traditionally consumed early in the day as part of breakfast. However, in recent years, the European community started to drink cappuccino throughout the day, a practice now followed by other countries around the world. Cappuccino is topped with a light layer of creamer foam which serves as an insulator to keep the drink warm for a longer time. The best thing about drinking a cup of cappuccino is having the dense and creamy yet light and airy taste and feeling in your mouth at the same time. prepared. You simply have to add a sachet of DXN White Coffee Zhino into a cup of hot water, mix it together and you are then free to enjoy it with your family at home or with friends in the office without having to wait for a long time at a restaurant. It is formulated together with ganoderma extract. The inviting aroma of this instant cappuccino indirectly evokes a feeling of joy after you drink it. Do not miss the opportunity to try it as you will discover a delicious taste that will bring to mind the original cappuccino from Italy. 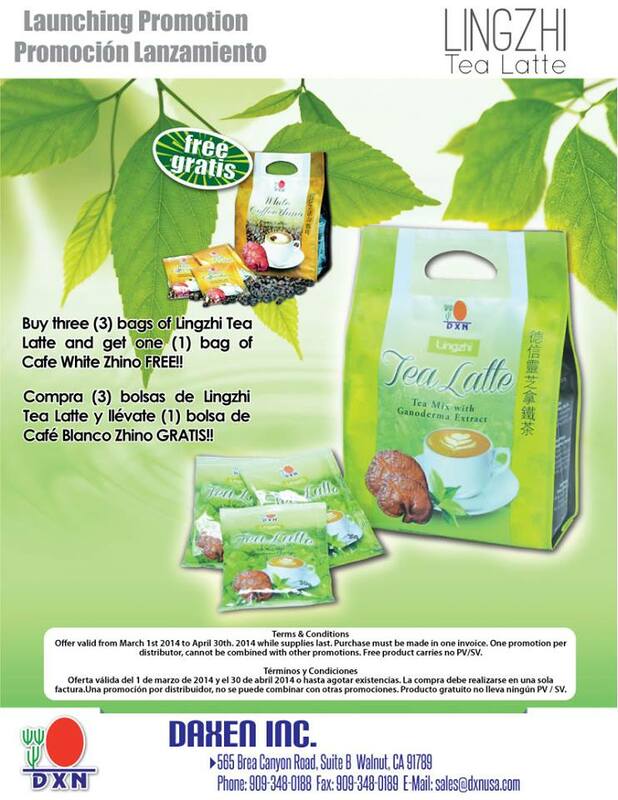 New Product Launching Promotion: FREE BAG OF LINGZHI TEA LATTE without PV/SV when you buy three bags of White Coffee Zhino. Offer valid from march 1st to April 30th 2014 while supplies last. ffee with milk and created around the 1950s. However, in Asia, latte and tea were merged together and that combination began to nd a place in the hearts of many tea lovers because the taste of tea is more concentrated and less bitter, which was enhanced with the addition of the delicious creamer. Besides its great taste, polyphenols found in tea has also shown to have antioxidant properties that can prevent ee radicals om damaging cells in our body. us, catering to Asia’s preference and to introduce this special concoction to other non asian countries, DXN has introduced a totally new DXN Lingzhi Tea Latte. It is a premixed of premium tea powder with non dairy creamer and ganoderma extract. nitely feel more energetic to start the day. New Product Launching Promotion: FREE BAG OF WHITE COFFEE ZHINO without PV/SV when you buy three bags of Lingzhi Tea Latte. Offer valid from march 1st to April 30th 2014 while supplies last. How to buy cheaper, on distributor prices with a registartion? Click here for more information! Spring Promotion is here!!! FREE DXN TUMBLER with a purchase of 100PPV!! While Supply last.